Normally Closed, 250VAC, 20mm float diameter, screw mount from outside. 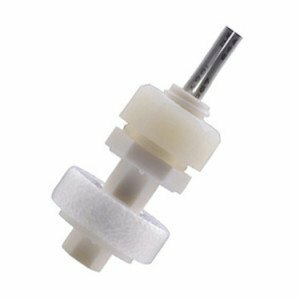 Normally Open, 250VAC, 20mm float diameter, screw mount from outside. Horizontal level sensor, normally open, 140VAC. 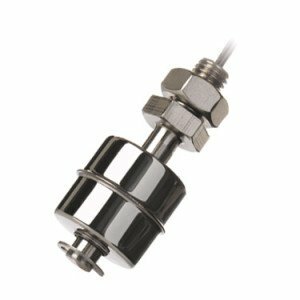 A float switch detects liquid levels within an application. They are also known as level sensors. They are widely used to activate alarms, pumps, control devices and as an indicator of the liquid level. 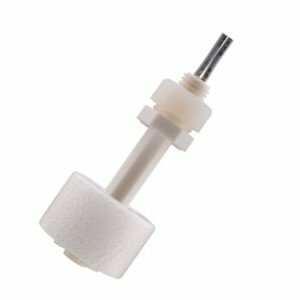 We offer both Normally Open (Form A) and Normally Closed (Form B) level sensors. Form A switches are used in applications where you need to detect when the fluid rises to a certain level. 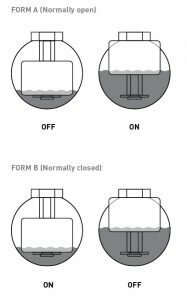 A Form B float switch is suitable for applications where the switch activates if the fluid lowers to a certain level, for example in a steam cleaner. Steam cleaners require water to operate and a float switch can be used to detect when the water container needs refilling. 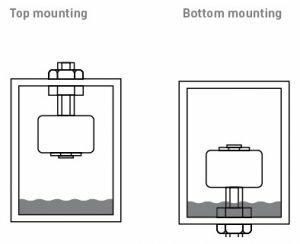 A float switch can be mounted at the bottom or top of the fluid container, however, when mounted stem up, operating functions are reversed. Alan Butcher Components supply the PLS range of float switches. This range is manufactured by PIC GmbH based in Nuremburg, Germany. • No power supply required – The reed switch technology is extremely efficient as a reed switch draws no power. 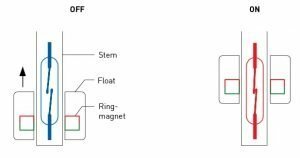 A magnet changes the state of the reed switch with no power consumption. • Customised version available. Talk to us about the specifics of your application and we will try to help. 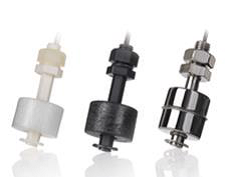 To support this comprehensive range of float switches, PIC supply customised Reed Chains. Reed switches and resistors are mounted onto a PCB. This PCB, now called a Reed Chain, is inserted into a long stem and a matching float moves up and down the stem, according to the liquid level. With the magnet inside the float switching the reed switches on and off, the total resistance changes. This change in resistance provides easy, seamless and continuous level information. Fluid tanks – tanks within industrial environments or machines contain fluids, lubricants and other materials necessary for their operation. A float switch can be used to detect the level of these fluids, activating an alarm or indicator light to advise the operator. Condenser Tumble Dryers – excess water is collected in a condensate tank when drying clothes in a condenser tumble dryer. 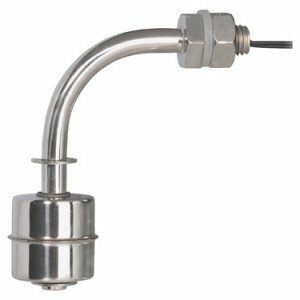 Float switches raise a warning when the level of this fluid reaches a critical point. Some dryers also use a float switch to control integrated pumps that remove the water. Coffee machines – use a combination of reed sensors and floats. 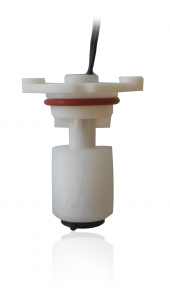 A reed sensor within the coffee maker housing is activated by a magnet contained within a float located within the detachable water tank. When the water level reduces to a specified level, an alarm is issued and no more coffee is produced. This protects the machine from running dry. 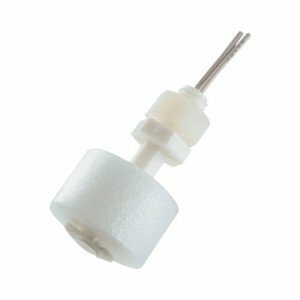 The small float switch, PLS-020-A-3, is one of our most popular products. Branded by PIC as the “world’s smallest”, this ultra-miniature device is fantastic for applications where space is limited. It weighs less than 6g. For more information on these items, click on the above image and use the “enquire about this product” form on the product page. You can then request additional technical details, a quotation or sample for evaluation. Please add your telephone number if you would like us to call you back. Alan Butcher Components has been working with PIC for over 15 years. PIC has more than 40 years’ experience within the field of reed sensor technology and has developed considerable technical expertise over this time. With production facilities in Turkey and China, they are able to offer customers specialised solutions quickly and efficiently. Their customers are varied and include white goods, home appliance, automotive, medical and measure-and-control manufacturers. At Alan Butcher Components, we supply to companies within inkjet printing, infection control, floor cleaning and the beverage industry. We also sell in to leading mainline distributors. Our strong relationship with PIC ensures we are confident in the quality of the products we sell and have the expertise available should technical queries arise. This communication enables us to respond to enquiries effectively and support our customers, providing the high level of service we expect to deliver.